A typical pyroxene has mostly silicon in the tetrahedral site and predominately ions with a charge of +2 in both the X and Y sites, giving the approximate formula XYT2O6. The names of the common calcium–iron–magnesium pyroxenes are defined in the 'pyroxene quadrilateral' shown in Figure 2. The enstatite-ferrosilite series ([Mg,Fe]SiO3) contain up to 5 mol.% calcium and exists in three polymorphs, orthorhombic orthoenstatite and protoenstatite and monoclinic clinoenstatite (and the ferrosilite equivalents). Increasing the calcium content prevents the formation of the orthorhombic phases and pigeonite ([Mg,Fe,Ca][Mg,Fe]Si2O6) only crystallises in the monoclinic system. 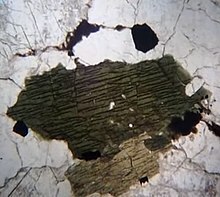 There is not complete solid solution in calcium content and Mg-Fe-Ca pyroxenes with calcium contents between about 15 and 25 mol.% are not stable with respect to a pair of exolved crystals. 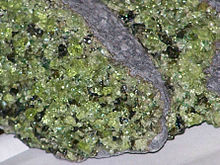 This leads to a miscibility gap between pigeonite and augite compositions. 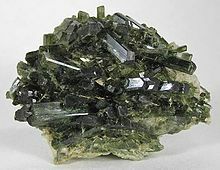 There is an arbitrary separation between augite and the diopside-hedenbergite (CaMgSi2O6 – CaFeSi2O6) solid solution. 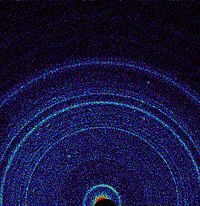 The divide is taken at >45 mol.% Ca. As the calcium ion cannot occupy the Y site, pyroxenes with more than 50 mol.% calcium are not possible. A related mineral wollastonite has the formula of the hypothetical calcium end member but important structural differences mean that it is not grouped with the pyroxenes.